After Sen. Trillanes dared presidentiable candidate Rodrigo Duterte to reveal his hidden wealth , his representative released the mayor’s BPI accounts last April 30 at the Pasig Branch of the said bank. 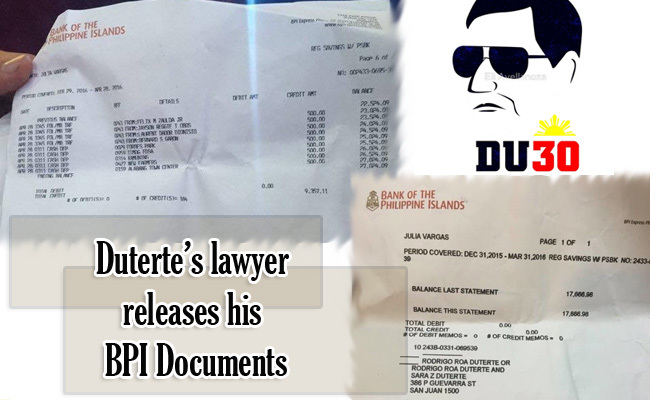 On the documents that Paola Alvarez of PDP-Laban brought, it can be seen that Duterte only had Php27,000 on his bank account with BPI. The summary of his deposits were from Dec 31, 2015 till March 31 this year with an amount of Php17,688 and it increased to Php27,024.09 last April 29. She also stated that vice-presidentiable candidate Trillanes has no credibility. On May 2, Duterte gave an authorization with his signed on Special Power of Attorney (SPA) to his lawyer, Salvador Panelo to open his account and to prove to Trillanes that all his claims that Duterte had a Php211 million in BPI- Julia Vargas branch were all lies. Duterte’s supporters and antis flock the BPI Branch to see if the allegations are true or not. Meanwhile Trillanes called Duterte a coward when the frontrunner for president failed to show a waiver that will allow them to open Duterte’s accounts on Bank of Philippine Islands with an alleged deposits of Php2.4 billion. Trillanes revealed on his interview that Duterte’s lawyer did not bring a waiver and he thought that Duterte’s camp do not have plans on opening his accounts. Duterte on his interview last Thursday dared Trillanes to make a statement on where did he get the infos of his alleged wealth and if Trillanes will file a case, he is willing to open his accounts. Trillanes brought a copy of Duterte’s bank accounts which claims that the tough talking mayor has a Php2.4 billion deposit. Trillanes then revealed that he got all this documents with the help of Joseph De Mesa. He also gave advice to supporters to think twice before supporting him.